”Cała Naprzód” is a newly created restaurant inside the Ośrodek Kultury Morskiej at the Długie Pobrzeże, up and running with a partnership with the Narodowe Muzeum Morskie boasting a prime location on the fourth floor of the neighboring building to the Żuraw one of the best known landmarks of Gdańsk. The professionals working on the menu strive to take into account the needs of every customer and seafood lovers can dive into kaszubskimi śledziami and bałtyckimi łososiami as well as many other dishes all prepared to the highest standard, though the kids might want to go for the traditional set of chicken nuggets with chips. For those with a sweet tooth await freshly prepared desserts and refreshing drinks to sweeten up your day. With those on the go in mind the menu was filled with homemade food created to eat in or take out so no matter where you go you can always bring a small taste of home. ”Cała Naprzód” is not only a restaurant at the heart of a museum however, it has a Meeting Room that can allocate up to 100 people, fit for business meetings as well as hosting parties. For real enthusiasts of sea climates there are opportunities to join in on regular meeting with globetrotters as well as shanty nights to come and enjoy. We aren’t forgetting the younger clients of course with offers to hold birthday parties under the care of professional animators joined with touring of the interactive exhibits and a birthday meal. The restaurant is a special place that enchants its guests, making them all feel at home as soon as they step through its doors. 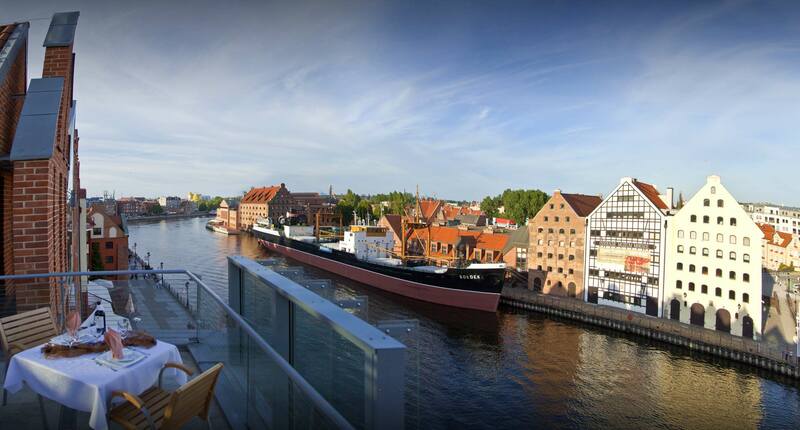 No matter if all you want to do is try the freshly prepared food, drink coffee on the balcony and look out across the panoramic view of Gdańsk or simply take the kids out for some ice cream, you can be sure that with ”Cała Naprzód” it’s full steam ahead!